This month, Australia’s Byron Bay Railroad, a short tourist shuttle, started service. It’s special, because it claims it’s a “world-first truly solar train”. I think it’s great that it’s a solar-powered train, but it’s actually even more exciting that it’s a battery-powered train. The PR imagery shows that there are solar panels on top of the train, which makes it seem the 3-km shuttle powers itself via those roof-mounted panels. When I read their website more closely, I saw that actually it’s powered more by a battery bank. The battery bank is charged by the roof-mounted solar panels and by solar panels on the train storage shed. This made me wonder — do the roof-mounted solar panels actually provide enough energy to power this train? To answer this question, I took a look at the numbers. Every hour, the train may generate 6.5kWh, in theory, under ideal conditions (which is only possible at full sun and if the panels were all oriented towards it), but it requires 8kWh to make its round-trip. So even under ideal conditions, the roof solar panels don’t provide enough energy to power the train. And that’s despite running extremely slowly (25km/h), and standing still ⅔ of the time. 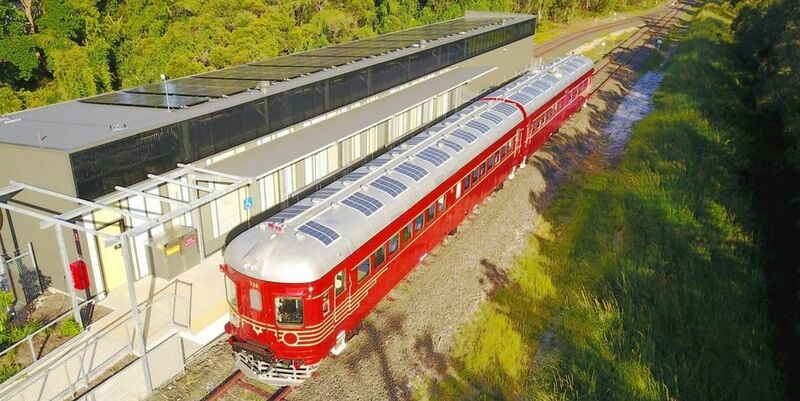 Effectively, the solar train concept is almost viable for the Byron Bay Railroad, because the train spends most of the time standing still. During all that time, the batteries will get charged by the sun, but it doesn’t have to spend energy too move. But even then, there’s not enough power coming from the roof-mounted panels. Most of the actual power for this system comes from a small solar power plant installed at one of its stations. And the train has a battery that’s large enough to keep the train running for almost 10 hours. So the solar panels on top of the train act mostly as a kind of top-up, to reduce the number of times the train has to be plugged in during layover. Don’t get me wrong. This is an interesting concept. And unlike India’s “first solar powered train” (that is really a train pulled by a diesel-locomotive, with solar panels that power the lighting and fans), most of the power for this train does come from solar — just not from panels installed on the train. In some sense, the fact that this is a battery train is more interesting than being a solar train. 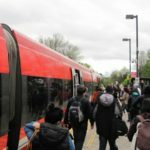 Trains powered by solar panels on the train are inherently not viable. If we covered Germany’s Highspeed trains completely in solar panels, and assuming Germany was actually a very sunny place, it would sill only be possible to generate 5% of the required power . For San Francisco’s BART transit system, which runs slower and thus uses less enenrgy, it would be possible to generate 10% of the required power via solar . On the other hand, the battery concept is indeed very interesting. For the Byron Bay Railroad, a vintage diesel rail unit was converted to full electric operation, and one of the two diesel engines replaced by a bank of batteries (the other was kept for emergencies). 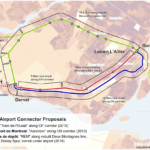 What I see is that batteries may become viable to replace diesel engines in places where it is too expensive to install overhead electrification — as long as those stretches aren’t too long. Traditionally, Batteries in trains didn’t work well — the vehicles and batteries were too heavy to make them work. Just like trucks are difficult to power with batteries compared to cars, due to weight. 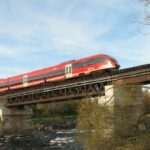 So hats off to one of the world’s few battery-powered trains, even if it wants to be known as a solar powered train. The ICE in Germany uses about 20kWh/km. It runs for about 0.5 million km per year. This means every train needs 10 million kWh of electricity per year. Assuming a very sunny 1500kWh/m^2/year, and a power efficiency of 40% (that’s a lot), and assuming the whole train is covered in solar panels (about 2.5m*360m of panels are facing the sun at all times), this means the train solar panels will generate about 0.5 million kWh per year. That’s 5% of the required energy. Some time back, BART had 669 cars requiring 300,453,720kWH/yr. San Francisco has a solar insolation of about 1600kWh/m^2/year. Assuming each BART car is ~22m long, again about 40% of efficiency, every car would produce about 42MWh per year. The 669 cars would produce 28 million kWh per year, which is about a tenth of what’s needed. Nitpick: a large part of the BART network (30% of the stations) runs underground, where there’s not much sun, so those calculations are probably a bit too optimistic. Not that it matters, I doubt even in SF anybody is crazy enough to put solar panels on trains. Ha! I didn’t consider that. My point was to do some back-of-the-envelope calculation to see viability at its most basic level (i.e. order of magnitude). BART is simply a rapid transit example for which power usage numbers are available.